This is a common structural problem that is caused from excessive hydrostatic pressure in the soil surrounding the home. This can occur whenever poor soil conditions exist around the foundation, and the earth swells up whenever it rains, or when there is melting snow on the property. This expansive soil puts a lot of pressure on basement walls (hydrostatic), and it will eventually prove to be too much for the wall to handle and it will begin to lean into the home. Additionally, you may notice the appearance of wall cracks next to the leaning structure. Delaying repair work for the problem will likely only result in more bowing or leaning of the structure, or the wall could eventually collapse in on itself from the weight of the earth and the home above. 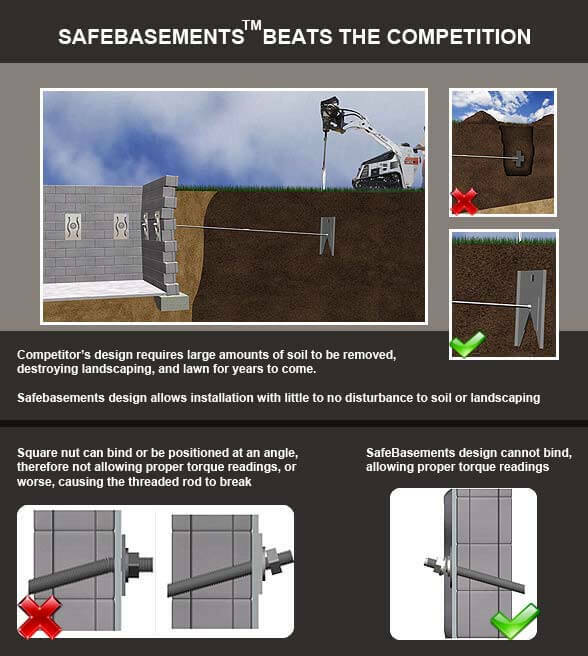 To take care of the problem, St. Louis Basement Pros can install products from SafeBasements™. Anchors can be installed deep within the earth in stable soil, and a plate will be installed inside of the home on the damaged wall. The two will be connected to each other with a strong, steel rod which can be tightened over time to provide the necessary lateral pressure needed to counteract the hydrostatic pressure from the surrounding soil. Minimal excavation will be required.